The Dutch side face a deficit going into the second leg having lost 2-1 to Los Blancos on Wednesday night. The stage was set beautifully at the Johan Cruyff arena in Amsterdam. The young and energetic AFC Ajax side squared off against the current European Champions and what followed next was another footnote in the line of ‘you have to take your chances when you are on top of the game’ chapter. Ajax were frantic and dominant in their pressing and Real Madrid were caught in its own defensive third for much of the first half during which the four-time Champions League winners created several chances but lacked a clinical nature in front of goal. 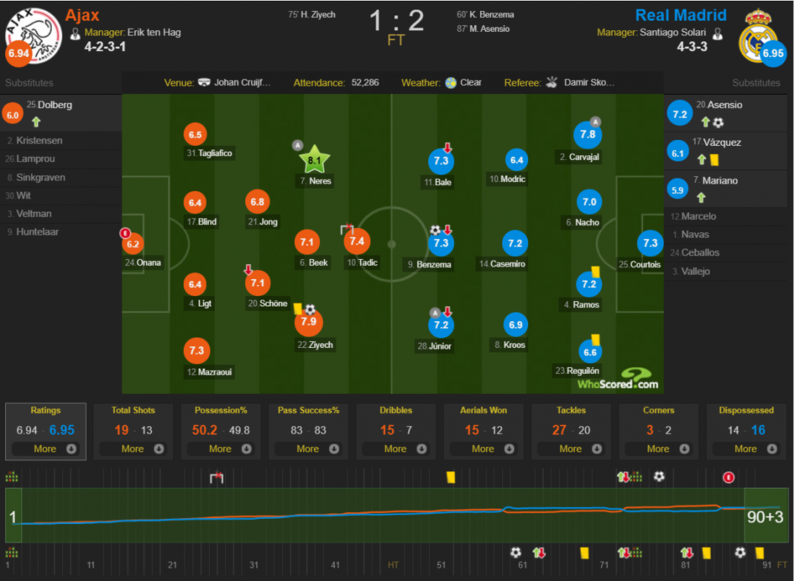 Sergio Ramos seemed to be commandeering the entire Madrid defence single-handedly. Tagliafico managed to get in on the rebound from a poor save from Thibaut Courtois and diverted it to the back of the net. The joy of the Ajax faithful did not last long however as VAR being called into the question, it was ruled illegitimate because of Dusan Tadic apparently being offside and was judged to be influencing the play. In the second half, Madrid converted their second real chance into a goal in typical Real Madrid fashion under Solari - Vinicius inspiring the move with a solo run and then laying it off for Karim Benzema to finish off. Ajax pulled back one soon through Neres’ layoff to Hakim Ziyech which was roundly finished off. Ajax piled men on in order to get a win to take back to Spain but were caught with a Real Madrid counter late in the game where Dani Carvajal's magnificent cross was calmly slotted into the net by Marco Asensio who made his appearance from the bench. Ajax could’ve restored parity on the night had Kasper Dolberg not been horrendously wasteful in front of goal. Ajax manager Erik ten Hag started with a variation of the 4-3-3 in what can be interpreted as a 4-2-3-1 to enable his side to press high and play quick positional football that stresses on long buildups through short passes and trying to get into the opposition box. Andre Onana started in goal and ahead of him was the backline of Matthijs de Ligt who became the youngest player to captain a side in the knockout stages of the UEFA Champions League at the age of 19 and the veteran Daley Blind whose father won a Champions League with Ajax. Tagliafico playing left-back was given the licence to roam further ahead on the pitch when he saw fit to attack while right-back Mazraoui was more conservative in this approach trying to keep the pacey Vinicius at a check. Ahead of the backline, Frenkie de Jong, Barcelona’s latest acquisition and Schone screened the defence and formed the bridge between transitions. Donny van de Beek occupied the central areas in midfield while Hakim Ziyech and Neres hugged the flanks. Dusan Tadic who has been on a good run of form lately, played the furthest forward. Santiago Solari started with a flat 4-3-3. Thibaut Courtois started ahead of Keylor Navas in goal, Nacho replaced Varane who was ill and partnered his captain Sergio Ramos in defence. Reguilon was picked to start ahead of Marcelo who has been woeful this season and Dani Carvajal started on the opposing flank. A midfield three of Casemiro, Toni Kroos and Luka Modric started as Solari did not think it would be wise to experiment in such an important Champions League knockout tie. Gareth Bale got the nod ahead of Vazquez while Karim Benzema and Vinicius Junior completed the attacking trio. Erik ten Hag was in charge of the Bayern B team when Pep Guardiola managed the first team and it is not surprising to see that ten Hag shares so many of Guardiola’s principles and models when it comes to playing football. In the first half, Ajax announced their intentions to the larger scene in football and did it in some style. From the very first onset, it was clear how frantic, energetic and immense their pressing game was. Dusan Tadic pressed the man on the ball like a madman as Neres and Ziyech looked to converge in to make a 2v1 and a 3v1 situation. 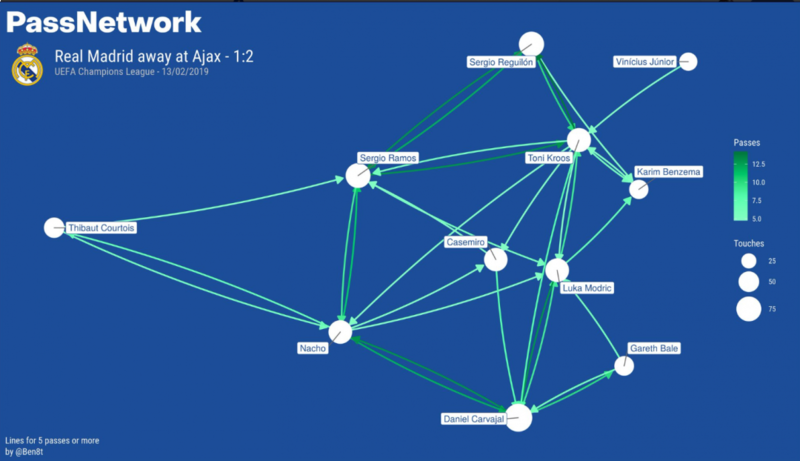 Behind them, van de Beek, Tagliafico and Schone formed the second line of pressure that cut out any possible supply routes that Real Madrid might look to play in order to escape the situation and behind them Frenkie de Jong, Matthijs de Ligt and Daley Blind played high up the pitch in order to take advantage of loose passes and long balls and start the cycle of buildup once again. I can’t remember the last time I saw a side press that well in the Champions League and the fact that Ajax have so many talented youngsters helped this cause. As a result of this intense press, Madrid were caught in their own defensive third for most of the first half, failing to get back. Vinicius and Bale had to drop back in order to aid the situation and the only route they seemed to play put from was through Vinicius on the left flank. Marzaoui held back to not allow him that space and de Ligt was quick to read the danger and snuff out with clean interceptions on Vinicius and Benzema. The front three of Ziyech, Tadic and Neres aided by van de Beek found each other with ease in the final third and exploited holes and space effortlessly well in the short distances to reach the Madrid box. 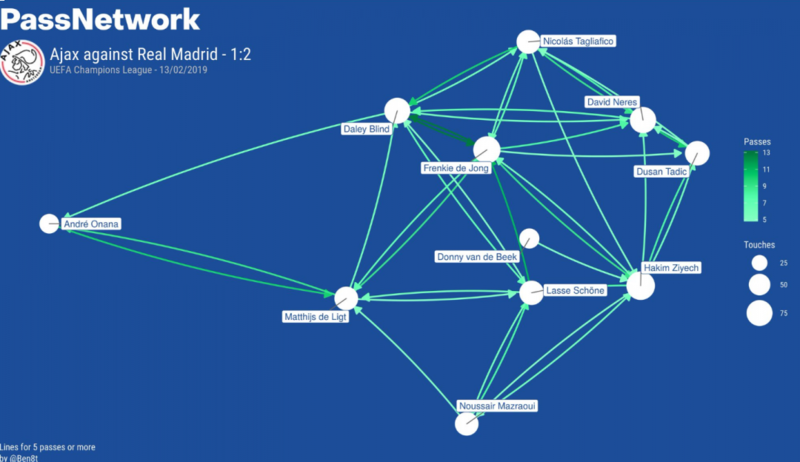 Van de Beek’s runs and Frenkie de Jong’s intelligent positioning made it hard for Casemiro, Kroos and Modric to get on the upper hand. However once Ajax reached the end of the final third, the nervousness in the young side would get to them as they missed many easy chances and were guilty of overdoing simple things on many occasions (one particular example of the latter was Hakim Ziyech). Ziyech missed the chance to put his side into the lead with only Courtois ahead of him, Tadic’s shot from the edge of the box went wide by just a few inches and his shot also hit the far post after getting into a tussle with Ramos inside the box. Had they taken their final chances well, Ajax could have easily been 3 goals up by the end of the first half. One interesting difference in the Ajax possession buildup as opposed to the rest of the teams that do that (like Manchester City and Barcelona) was that they were faster in their transition. Normally, in a possession-based outfit the goalkeeper plays out from the back- Onana, however, chose the long route option. De Ligt and Blind were also quick to find de Jong and Schone in midfield who pinged and sprayed their passes ahead as quickly as possible. Despite not being as energetic enough as they were in the first half, Ajax still started the second half on top with calm hold of possession. Every manager in the world knows that it is impossible to press high and actively for the entirety of ninety minutes. And it is these moments when the team collects its breath and drops the levels of pressure and holds back that goes on to decide the game. And it is on these moments that Real Madrid cleverly took advantage of. In the 60th minute of the match and with Schone committed further forward, Reguilon played a long ball to Vinicius who finally had a 1v1 with Marzaoui and beat him with ease and entered into the box. His mazy run was too hot to de Ligt and Blind to handle who were cautious of making a challenge so as to not foul him inside the box and his simple layoff was finished powerfully by Karim Benzema. Despite being the lesser side for so much of the game, Real Madrid found their moment and these are the moments that defined their route to three Champions Leagues in three years. They would have another one of these moments where Ajax was caught too desperate for a goal and Asensio would score in the final few minutes to give his side the victory. With his side chasing the game, ten Hag took off Schone and introduced an extra attacker in the young Kasper Dolberg who was an exciting prospect a couple of years ago before injuries took its toll. This decision to sub on the inexperienced Dolberg on the 70th minute ahead of veteran goalscorer Klaas Jan Huntelaar worked against them as Dolberg missed two simple chances that could have decided the match in Ajax’s favour. Ajax would feel hard done to not get even a draw out of the game despite playing so well. A decisive factor that will help Ajax’s cause in the second leg is the fact that Ramos picked up a late yellow card and will miss the next leg in Madrid. With Ajax repeating the same intensity they showed in Amsterdam and with better luck, better finishing and the absence of Sergio Ramos who single-handedly stood between the Ajax frontline and an exposed Courtois, the Amsterdam based outfit still have a decent shot of pulling off an upset.